Psalm 23 is a well known Psalm to many of us. In fact, you may have it memorized. It is a Psalm that has brought me comfort in my greatest times of need and reminds me of the care and protection of my Good Shepherd. Let me encourage you to take just a few minutes to read this Psalm slowly. Meditate on the words. As you do, think of word pictures that are being portrayed in this Psalm and write them down. Notice this Psalm does not promise us freedom from concerns and difficulties. However, we are promised comfort, care, and the compassionate watchful eye of our Shepherd, Jesus Christ. We are welcomed with favor to a place right at His table. A place of secure belonging and contentment. Our path may not be easy at times, but we are promised rest, goodness, refreshment and mercy along the way. Stop for just a moment and thank Him for what words came to your mind today as you read this Psalm. These are His precious gifts to you. Now, before you go on your way today, go ahead and take another big breath and exhale. Let the words of this Psalm go with you today. He’s with you. There is no need to be concerned or fearful. Trust. He’s leading you on for the purpose and glory of His great name! 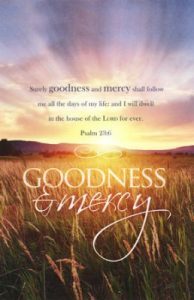 Have a grace full week knowing that goodness and mercy are right beside you.